Blooming live plants create a heartfelt display for many adults. Unlike cut blooms, live arrangements provide color for longer. This may be a few weeks, or a few months, depending on the species. Blooming options may be simple and understated or extravagant. Traditional options may be used, such as roses or peace lilies. Exotic plant choices may also be selected when they are available. Plants are often sold in areas such as Naperville, IL, Waterbury, CT, Yakima, WA, Tallahassee, FL, and Fontana, CA but can include other cities/regions. 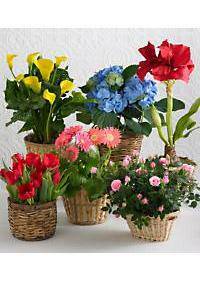 For choices of exotic plants, call the local florist and inquire about any options for special orders. Live blooms create an instant splash of color that will last. If watered and given sun, they can produce flowers for several weeks. Some may continue to bloom for several years with proper care. Protective containers should always be used to prevent dripping. An additional liner may be placed in the basket or container. Some may prefer to add an extra liner underneath the outside. The liners keep dirt and moisture from spilling onto tables and desks. For containers that are loose or open, a foil wrapping is often used. These are recommended as they can catch water and loose soil. Typically, the plant basket will come with care instructions. This often describes the species, and details any specific needs. It will also list the sun and water requirements that it has. For most blooming species, indirect sun is often the best. Many blooms will wilt or fade with too much direct sunlight per day. There are exceptions, such as sunflowers, and other sun loving plants. Most baskets should be placed in a location that is well lit. This may be in a bright location of the home, or on an office desk. Some may also choose to use an area that is outside or near a window. Some species need regular watering to keep the soil moist. This may mean a weekly watering, or every other day for some species. Some blooming choices, such as orchids, may need a gentle mist instead. It is important to not over or underwater the living arrangements. Too much water can cause them to rot, which can lead to plant death. Too little water and the blooms may wither, along with gradual death. Unusual arrangements, such as exotics and bonsais do require more care. These often require water misting, or regular pruning to stay healthy. The upkeep is often worth it as the blooms are often stunning. Blooming arrangements can be used for romantic and casual occasions. They can be used for weddings, anniversaries and other events. They may also be used for centerpieces for receptions and gatherings. When used as a centerpiece, there are two main options for baskets. The first is to go with simplicity, and pick an understated bloom. These offer colorful flowers, but without being too extravagant. The second option is to seek out a more elegant theme for blooms. This may mean a coordinated arrangement to use for a wedding or party. The containers may match decor, or be used to compliment blooms. A single species may be used for flowers, or several can be added. This allows for more personalization on the living arrangement. This is common for spring and summer flowering plant mixes.